We’re currently drawing content from 98 blogs. 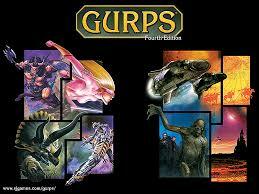 We are so very, very close to having 100 GURPS blogs. Game Prep: Monsaanti-Neogene Corporation (2/28/18) – Stating out an “evil korp” that my Traveller PCs are fighting against. Utilized the template found in Boardroom and Curia. Game Prep: Porozlo Skimmers (2/27/18) – Figuring out the stats for available “air car” which will come into play during session 4.07. References to Ultra-Tech and Traveller: Interstellar Wars. Stats are somewhat abused. Game Prep: Imperial Envoys (2/26/18) – Fleshing out my Imperial Envoy, which is a special intelligence agent who answers directly to the sub-sector duke. Think a Mass Effect Spectre or Star Wars Emperor’s Hand or non-extremist 40K Inquisitor but in the Traveller universe. No stats abused, but I do reference some expected advantages & disadvantages that an Envoy will have. Game Prep: Traveller, 4.07 (2/25/18) – Making plans for the 7th session of our ongoing game, also known as me scrambling to rewrite following the madness caused by PCs. This is mostly stream of consciousness rambling. No stats abused but references made to Action and Ultratech. Recap and GM Notes: Traveller 4.06 (2/25/18) – Musing about the GURPS: Traveller game I ran on 2/24/18. Includes a link to the YouTube recording of our stream. No stats abused. Game Prep: Porozlo (2/23/18) – My take on Porozlo/Rhylanor in our ongoing GURPS: Traveller game. No stats abused, although several GURPS books referenced.